A Lufthansa executive has mentioned this week that the airline paid out 500 Million Euro in compensation claims during the 2018 financial year. Lufthansa as a EU carrier is bound by the EC261/2004 regulation which makes them liable for substantial cash payments to passengers affected by long delays during irregular operations. Their liability goes for all flights worldwide no matter if going to or leaving from the European Union unlike non-EU carriers which are only liable under EC261 when leaving an EU airport. Reuters (access here) reported earlier today that Lufthansa had to shell out a whopping 500 Million last year. Lufthansa spent 500 million euros ($573 million) on compensating passengers for flight delays and cancellations last year, a senior company figure said on Friday. A Lufthansa spokesman could not confirm the cost cited by Thorsten Lange, the German airline’s head of fuel purchasing, at a Platts oil product conference. However, the group’s bill for such problems had more than doubled to 350 million euros in the first nine months of the year, the spokesman added. The figure for the full year is due to be published next month. Lufthansa in fact has lots of operational problems for the last 2 years, some of which stem from their integration of the now defunct Air Berlin, structural issues at airports such as Berlin-Tegel and Frankfurt isn’t a beauty either with their late night curfew. That curfew is often responsible for flights to Asia and South America being cancelled if there is even the slightest operational issue and then it’s payday. Each passenger on such a cancelled long haul is due 600 Euro in compensation as they will incur a substantial overnight delay. Airlines are required to inform passengers about their rights in the form of a printed leaflet when irregular operations occur. Many airlines intentionally don’t do this and that alone is a violation already. 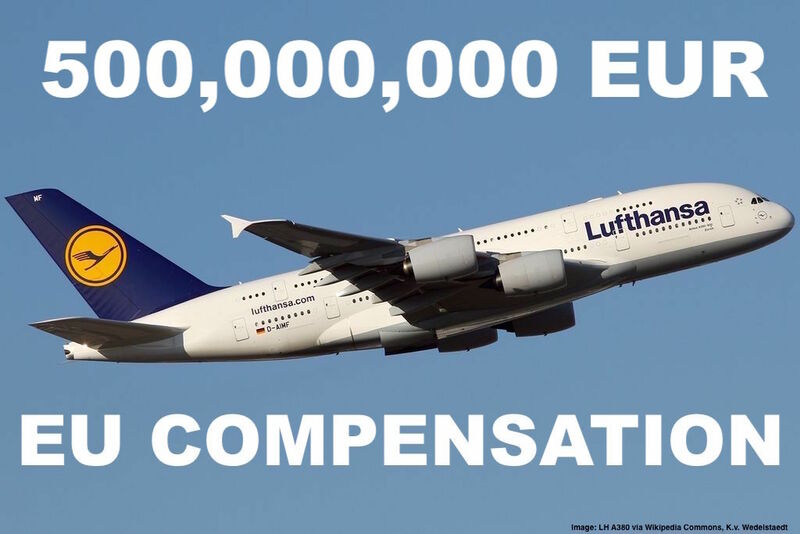 Even with a pretty hefty number such as 500 Million Euro one has to realize that it could be much worse if every passenger who is entitled to it would actually claim their EC261/2004 compensation. I’d say that less than 20% of all passengers go through the claim process and of those 20% many give up when the airline declines their request straight away or simply doesn’t answer. I had a couple disputes with Lufthansa over EU compensation over the years and except the last one in December always had to involve the German Ombudsman (Schlichtungsstelle) in order to get the money from them.